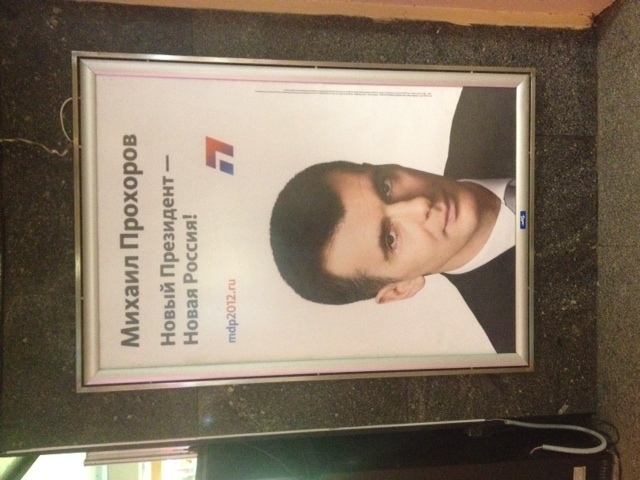 There’s some argument about whether Prokhorov is truly in opposition to Putin, whether he’s a faux-candidate supported by the Kremlin to give the appearance of competition, or whether he might be trying to play both games at once. In any event, he’s running, and this is one of his ads. This poster succinctly illustrates what I see as one of the important features of the current political landscape in Russia: opposition politics aren’t particularly concerned with providing an alternate vision of policy. Rather, they’re focused intensely on being in opposition to what currently exists. It’s such a struggle even to mount an opposition that fighting the fight becomes its own cause to some extent. For a long time, a group called Strategy-31 has been demonstrating for the right to assemble in public, a right guaranteed by Article 31 of the Russian Constitution. (They hold rallies on the 31st of each month with enough days.) I observed one of their rallies when I was last in St. Petersburg in 2010: more police than protesters. Arrests began minutes after the event, as is usual. The raison d’être of the organization is simply to show the public (Russian or international) that this supposed right doesn’t exist in practice. For years, now, this seems to have been the state of opposition politics in Russia. So much energy is spent merely trying to exist in the public sphere that little is left even to start conversations about what opposition candidates might actually do differently, if they gained power. What should be the responsibilities of government? What problems should it try to solve? How well are current policies working, and what alternatives might be tried? Thus one of the questions I’m interested in is whether these conversations take place elsewhere, or in some other form. What kinds of relationships do Russians have to government and politics, and how do they envision citizenship? How is contraception like abortion? As the debate surrounding insurance coverage of contraception has become more public, more people have become aware that many within the pro-life movement regard contraception as essentially equivalent to abortion, especially hormonal contraceptive methods, and perhaps especially the “morning-after” pill. “They can and do prevent implantation or can cause ejection even after implantation,” said Richard Land, the head of the public policy arm of the Southern Baptist Convention, referring to morning-after pills and citing medical advisers to his group. “IUDs emphatically do allow conception and do not allow implantation,” he added. Scientists generally agree that this is not true (as summarized in the article linked above), but nonetheless many pro-lifers feel that there is a basic similarity. One possible response is to jump in with the scientific evidence, and plenty of people have done so—for example, during the contest over Mississippi’s personhood law last year. These kinds of arguments don’t appear to have much impact on those already convinced that the pill is an abortifacient. There’s always something interesting going on in Russia, but I do feel a bit lucky to be heading out right now–so I hope I’ll be able to add some firsthand observations in coming months. Right now all I’ve got are a couple of inklings, hypotheses, or curiosities I’m determined to follow up on once I’m over there. The first is this: above I glossed the goal of the demonstrations as “to protest election fraud.” But really, this remains an open question, perhaps especially for an anthropologist. Likely some participants were angry about ballot tampering, some about the lack of true competition in elections. Some came as a lark, some because they remembered standing up against the 1991 coup attempt. Perhaps some were trying to impress a friend, and some to infiltrate a developing political opposition. I’m curious about the specific motives of particular people. As I was listening to a Feb 3 podcast with Sergei Parkhomenko, much of which he spent encouraging participation in the Feb 4 demonstration, I was struck by a statement he made near the end: ‘This event isn’t political, it’s civic.’ In other words, these actions aren’t precisely about forming an opposition party, or even specifically directed against Putin (though certainly those elements exist). Rather, he was suggesting that listeners view their participation as something of a civic duty, regardless of their feelings about specific parties. Connected to comments quoted across many news stories (and twitter posts and blog comments) I’ve read about these events, many of which reference ‘respect’ and ‘dignity,’ I’ll be wondering (tentatively, in the most preliminary way) whether and how these protest actions are related to how Russians feel about citizenship. What role should the state have toward its citizens? What are their relationships to their government? A further thought: Anyone who’s watching these protests, thinking that the most important thing is whether Putin will be re-elected, is almost certainly asking the wrong questions. Scholars of Soviet history (Alexei Yurchak in particular!) know all too well that a great deal of change can happen below the surface, while the political leadership remains the same.